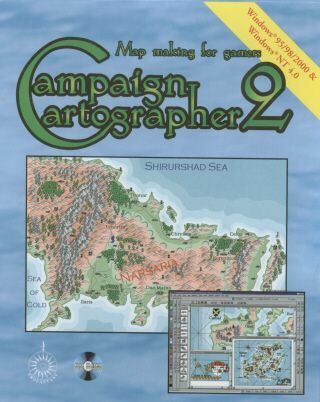 Die Serie Campaign Cartographer (CC2) ist die eindrucksvollste Software¸ wenn es um das Gestallten von Kartenmaterial im Bereich Rollenspiel und Tabletop geht. Bei CC2 handelt es sich um ein ausgewachsenes zweidimensionales CAD-Programm mit umfangreichen Bibliotheken voller Fantasy-Symbole um Landschaften¸ Gebäude¸ Raumschiffe uvm. zu kartographieren. Zusätzliche Add-Ons wie der City- oder Dungeons-Designer und zahlreiche Symbolbibliotheken (oft kostenlos) liefern zusätzliche Funktionen und Bilder zur Gestaltung verschiedenster Themenbereiche. Wer es lieber 3D mag findet mit dem Realm Overseer 3D und City Overseer 3D weitere Tools¸ mit denen sich die dritte Perspektive 'herbeizaubern' läßt � so können Landschaften¸ Städte und Gebäude am Bildschirm durchwandert werden. Download: We've just released an updated version of our world building software¸ Fractal Terrains Pro. We've also updated the demo to the Pro version¸ so why not try it out at no charge ? City Designer has thousands of symbols¸ building creation tools¸ and random street generation. Version 3 adds amazing effects¸ new artwork from award-winning artists and automatic floorplan generation to all our existing features. Whether your characters need a stronghold¸ your villain needs an impregnable bastion¸ or your miniatures need a fort to besiege¸ Source Maps: Castles! is what you need to fire your imagination. SM:C offers twenty-five archetypal castle layouts with surroundings and 3D views. Based on floorplans of the historical castles with conjectural detail¸ the plans paint a complete picture of these fortifications in their heyday. SM:C also offers you drawings¸ oodles of historical detail and fantasy adventure material to use in your favourite RPG. SM:C includes a powerful viewer which enables you to print the maps at any scale¸ even across many pages for miniatures. You can hide or show features¸ and zoom in with no loss of detail. You can search for specific castles and rapidly click between floors¸ external and 3D views. We provide the castles and adventure material in PDF view¸ too.